Portraits by Juliette Binoche of Hou Hsiao-Hsien and Suzan in Le voyage du ballon rouge (Flight of the Red Balloon, 2007) © All Rights Reserved. NEW YORK, NY.- Actress, dancer, poet, painter… Academy Award® winning actress Juliette Binoche (The English Patient) has more than one trick up her sleeve. In September 2009, her various talents will converge in New York City and Brooklyn in “In-I & Jubilations,” a month-long series of artistic events that include dance performances (Akram Khan’s “In-I” at the Brooklyn Academy of Music), a film retrospective (also at BAM), book signings (of her art book Portraits In-Eyes), a new film release (Paris by Cédric Klapisch), a documentary about Juliette Binoche produced by her sister Marion Stalens (Juliette Binoche: Sketches for a Portrait at the French Institute Alliance Française) and an exhibition of her portraits and poetry at the Cultural Services of the French Embassy. 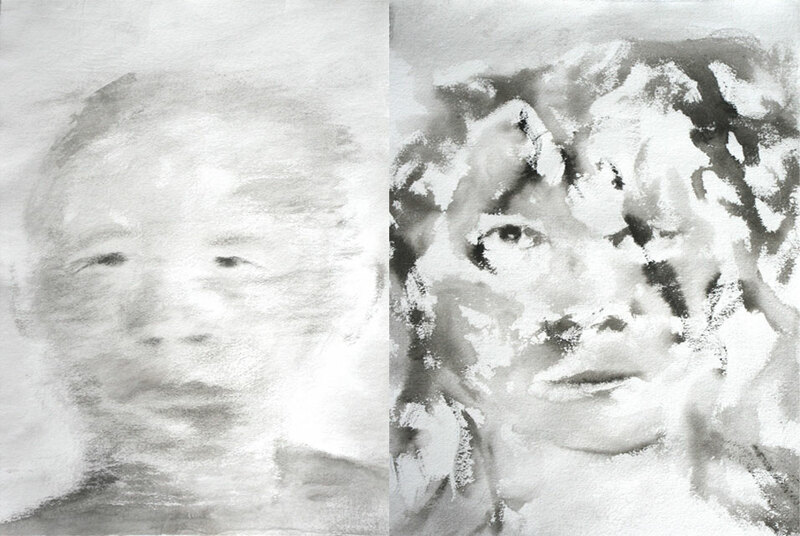 This exhibit, “In-Eyes,” will include 58 ink washes on paper as well as poems, all created and selected by Juliette Binoche. It will be her first-ever art show on American soil and will offer a unique opportunity to discover a new facet of this multi-talented French artist.Ever since receiving a commission from the Cahiers du Cinéma for a series of portraits in July 2007, Ms. Binoche has not stopped painting during her movie shoots. But she had been painting off set for far longer, and first showed her work publicly in the 1990s (in 1991 her art work was featured in the movie The Lovers on the Bridge, in which she starred as a painter, and in 1993 she exhibited a series of work done in collaboration with French artist Christian Fenouillat). Favoring portraits, Ms. Binoche has not only depicted many of the famous directors with whom she has worked but also characters she has played, in what is a rather unique spin on the self-portrait tradition. “In-Eyes” will feature 29 triptychs, each including one of these “in character” self-portraits, a portrait of the related movie’s director, and a poem addressed to the director. These works offer a personal view, full of emotion, of the key encounters that have influenced Juliette Binoche’s movie career.